This is the only picture available of a UFO that has been terrorizing residents in the state of Missouri for the past few days. Apparently the brightly-lit vehicle has been flying low over cars on the highway, and appears to break up into smaller craft. Dozens of witnesses have reported seeing it, boosting Missouri to a "UFO Alert" level 3. The state had the 8th highest number of UFO reports in the U.S. last month. What's going on? 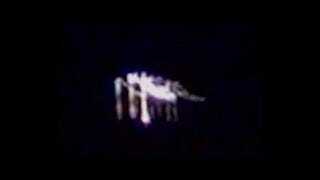 We saw this object that had shape of stealth bomber that had green and white lights hovering over the highway. At first I told my husband and children that I thought it was a blimp, but as we got closer it was doing weird maneuvers." We turned around to get closer, and by the time we got close enough it shot if like a rocket. There was another object in sky that it flew over and the light on it was a white, very bright light. I then called my father - retired navy - to ask him if stealth bombers hover and have green and white lights - and he said 'no.' He said that it might be a Harrin. So I looked it up and it didn't look like it either. So what was it that I saw? The closer we got, we realized the object was just hovering very low over the cars moving extremely slow," the reporting witness stated. "There were hundreds of huge, extremely bright lights completely covering the front of the craft. These lights were almost blinding, and resembled stadium lights. As we were trying to take pictures out of the window, the craft was over our car and began to turn south, no sound whatsoever was coming from it - dead silence other than the passing cars on the highway. The underneath and back of the craft didn't have as many lights as the front head on. It was gigantic. The front seemed rounded, then boomerang or arc-shaped as it turned. Not sure if it changed shape, but for sure two different shapes compared with head on to the back side of it. It took off a little bit faster, but still at fairly low speed compared with airliners or even stealth bombers which would both be very loud, this again, was silent. After it turned away, my husband thought it broke into three separate pieces. I thought it was just so big, it expanded and the three brightest lights appeared to be separate. I think my favorite thing about this UFO is that the picture of it looks so much like one of the aliens from Space Invaders. The Earth is being invaded by 8-bit monsters!